State officials, veterans and service members gathered at the Massachusetts State House to commemorate 100 years since the end of World War I. Mark Levenson has a deep understanding of the sacrifices American soldiers made during WWI. “My great uncle Benjamin Rutstein served in World War I and he was killed on July 15, 1918,” Levenson said. Levenson, whose family is Jewish - some who immigrated from Russia, says his great uncle made the ultimate sacrifice during the war to protect American liberties. “America was free America was democracy. It was open to all,” he said. IMAGES: Veterans Day Ceremonies Held Across Mass. Veterans Day this year comes 100 years to the day after the end of WWI. During a Veterans Day Centennial ceremony at the State House Sunday Levenson was among those who gave solemn remarks along with Lieutenant Governor Karyn Polito, other dignitaries, vets and service members. Former Prisoner of War Timothy Sullivan lit a candle in honor of all Prisoners of War. For Sullivan this day is about learning from the past. “World war one was supposed to be the war to end all wars,” Sullivan said. But WWI did not end all wars. Many more would follow, many more people would serve and many would not come home. 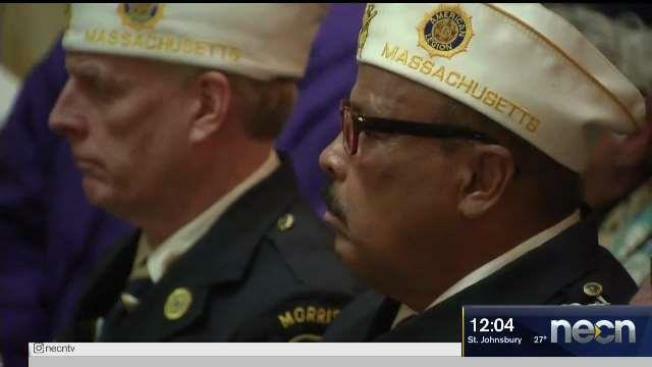 “All the veterans who fought and also for our country service and sacrifice,” Levenson said. The event was hosted by the Department of Veterans Services.